SG stimulates organizational growth by cultivating and unleashing the abundant capacities of your people to launch your company to next-level success. 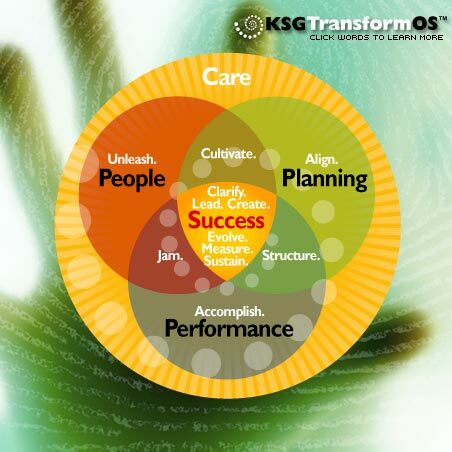 KSG Transform OS activates the entire operating system of People, Planning and Performance by aligning your management team and company culture and providing innovative strategic pathways to achieving better real-time results. gets results in a timely fashion. Aggressive yet sensitive, he has pushed us to grow both as people and as an organization. Chris is a highly respected leader in the SF Bay Area construction industry, strategic advisor, clarifier, coach, and provocateur of sustainable change, who champions the philosophy that the best leaders are the discoverers and developers of other peoples' human potential. Real professional and organizational transformation is possible for you and your people with minimal disruption to day to day operations. Chris Stanton can help you remove obstacles to your success and focus your valuable time and resources on unleashing untapped capabilities.